GOLD, the sellers are serious! After the break of daily MA100, the road to 1080 is open for the sellers. Previous up trendline at 1116 is the next target, 1100 after. This is the 5th red day in row for the precious metal and it looks like there is no sign of the recovery, the sellers are to serious and this looks ugly now, the buyers have disappeared. Could we see 1077/80 to be attacked soon, the low of 2015.? 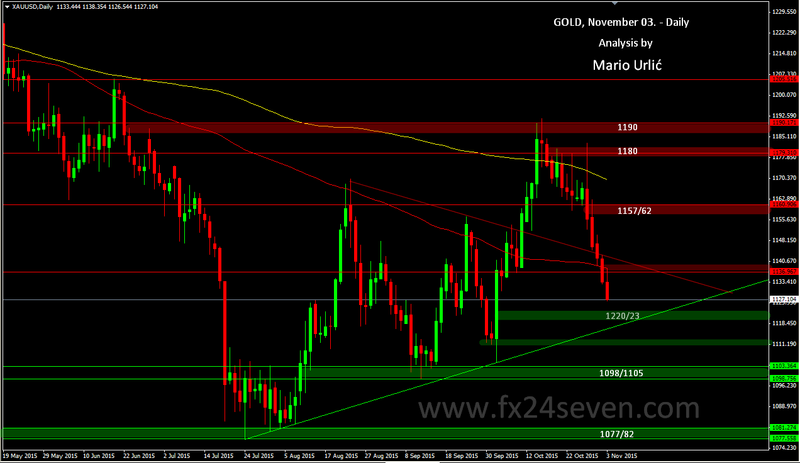 Everything is possible, keep watching this levels, it’s always interesting on gold. On the way up, 1136/40 is the first and pretty strong resistance now. In my last gold analysis I was pointed at this 1220/23 level, as an possbile support, but now that looks to me only as an station on the way deep down.